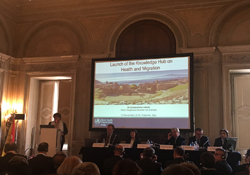 WHO today launched the first ever European Knowledge Hub on Health and Migration, with financial support provided by the Regional Health Council of Sicily, Italy. The Knowledge Hub will support the work of those who deal directly with the health aspects of migration, serving as a repository for scientific evidence on the subject. Although the number of refugee and migrant arrivals has seen an overall reduction in recent months, migration to Europe continues at a steady rate. So far this year more than 160 000 refugees and migrants have reached Italy by sea and over 170 000 have journeyed to Greece. In 2016 more than 4200 people were found dead or reported missing at sea, compared to the 3771 in 2015. The health systems in countries receiving refugees and migrants should be able to deal with the immediate health needs of new arrivals, as well as diagnose and treat common infectious diseases and noncommunicable illnesses. They should have effective disease surveillance and reporting systems in place to investigate and respond to outbreaks. The Knowledge Hub will act as a learning platform for all stakeholders working in the field of migration and health, including policy-makers, health professionals, social workers, managers of migration centres and first-line responders, in keeping with the call for intersectoral work outlined in WHO’s Health 2020 policy framework. dispelling myths and misconceptions around health and migration through the creation of a platform for evidence-based interventions. Sicily has become the southern door to Europe for hundreds of people fleeing conflict and war, or seeking opportunities to improve their lives and those of their families. In 2014 the Sicilian Health Council worked with WHO to develop a regional contingency plan to improve the public health response to migration on the island. “The plan included establishing procedures to increase the efficiency of the logistical, financial and human resources involved in the health response,” said Baldassarre Gucciardi, Councillor of the Sicilian Health Council. The Sicilian Health Council has now partnered with WHO/Europe to help improve migration preparedness in other European countries and to promote health systems focusing on patients’ needs and the reduction of health inequalities within the migrant population. convening a high-level meeting in November 2015 in Rome to agree on a European framework for the health response to migration, in partnership with the Ministry of Health of Italy. This framework served as the basis for the first European strategy and action plan for refugee and migrant health, which was adopted by 53 European countries in September 2016.